This module does not require the CMS. Place the module under your root project directory. Select Misdirection through the CMS. 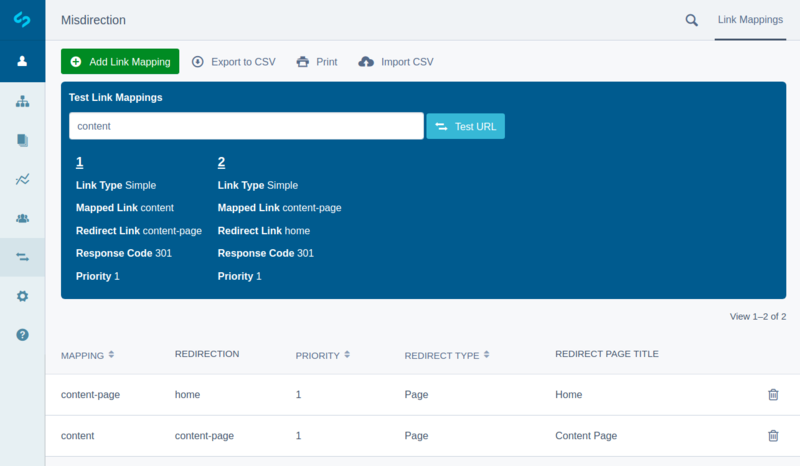 These allow both simple and regular expression link redirections, and can be used for legacy page redirection, vanity URLs (more below), or redirection based on specific URL patterns. While it is possible to create these manually (as above), a content author may directly create a link mapping from a page. However, it should be noted that these are instantiated with a low priority of 2, and therefore other link mappings with higher priority will take precedence. When a user happens to encounter a page not found, a specified rule may be triggered to prevent displaying this. It is possible for an administrator to configure a global fallback through the site configuration, however a specific page setting will take precedence. The link mappings are processed server side to prevent inefficient and problematic mappings, using a request filter. 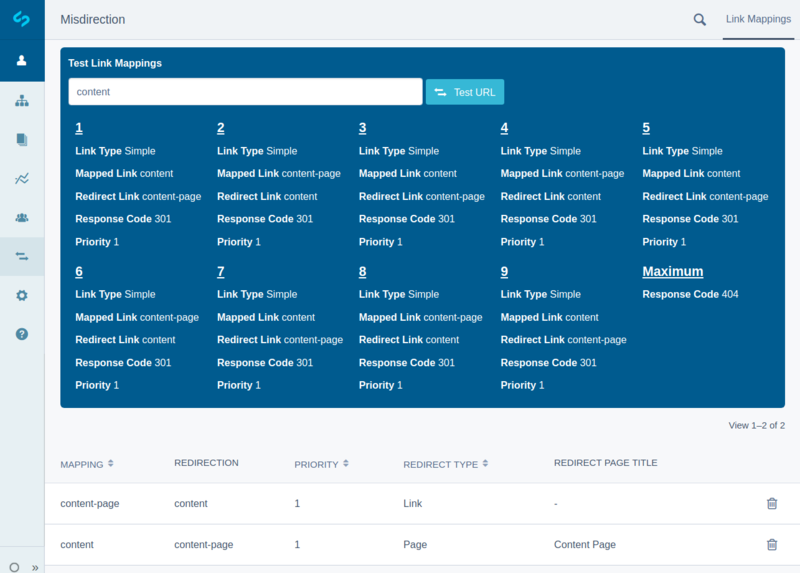 When you want to see exactly what is happening behind the scenes for a given URL, the model admin provides a powerful testing interface! It is possible to bypass the request filter completely by appending ?misdirected=1 to the URL. This is fantastic for debugging, however does not apply to the testing interface for obvious reasons. This may be completely replaced, in which case legacy URLs will no longer resolve based on page version history. 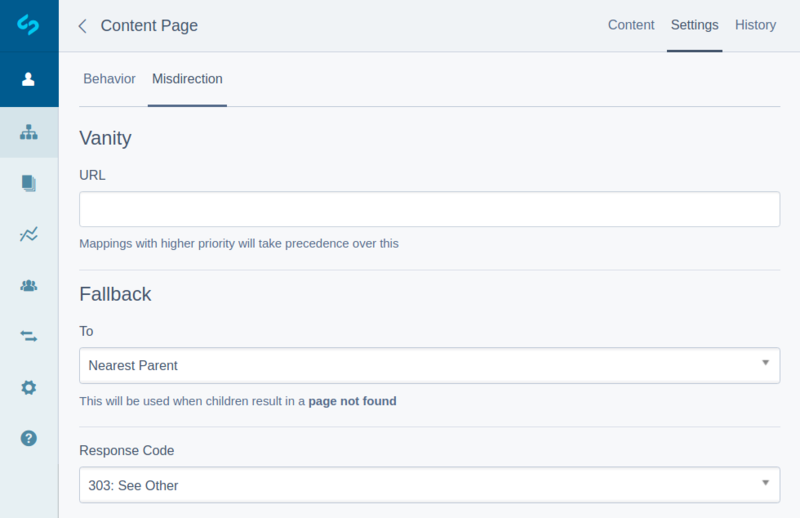 When a page is moved, the appropriate link mappings are automatically created and maintained. This allows full control over which legacy URLs remain in the system.